I rarely re-read a book. The pressure to read new fiction and the sheer amount of new work published every month means it’s hard to go back – even if you have good memories of the first time. 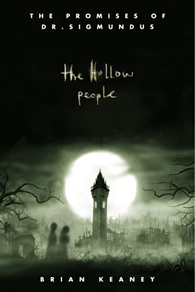 With Brian Keaney’s The Hollow People it has been a constant frustration because I really enjoyed the first volume in his trilogy (The Promises of Dr Sigmundus) but was never able to find the subsequent volumes in any bookshop. Currently I am also waiting for Six of Crows by Leigh Bardugo (The Grisha Trilogy), as Waterstones locally aren’t stocking it – despite the author touring the UK promoting the book. So, it being a foggy wet afternoon, very reminiscent of the weather in The Hollow People I went to Amazon and finally ordered the final two Keaney books and Ms Bardugo’s volume – carefully avoiding those Amazon Prime entreaties, as I don’t want to cough up £80 for the pleasure. If you haven’t met Dante, the poor downtrodden kitchen boy working in a mental institution akin to the terrifying Shutter Island, you are missing something important from your library. 'Some people gave orders, others followed them. That was the way things were done in the asylum. There was a very strict chain of command'. Dante is virtually shunned; his mother was one of the inmates and committed suicide diving off the tower that overlooks the Tarnegar asylum. His life is one of unremitting misery and he is picked on by kitchen staff. He is illiterate but has secret skills as a carver that he keeps to himself. Bea, the daughter of two privileged physicians in the asylum, is the almost fourteen-year-old girl reluctantly preparing for her coming-of-age ceremony where you have to memorise the thoughts of Dr Sigmundus and finally succumb to the power of Ichor, a drug, given weekly, that prevents you from dreaming and provides ‘harmony and peace’ in society. ‘Where there was anxiety, there shall be peace, where once we lived in fear of violence, in future we shall fear no more’. 'If Bea had been able to choose a life for herself it would have been quite different. She would not have been born in an asylum on the remote island of Tarnagar. She would not have picked two very dull and dutiful junior doctors for her parents. And there would have been no coming-of-age ceremony'. Bea isn’t convinced this is her future. All around her kids her own age can’t wait for the ceremony and the delights of Ichor, but she questions it, and though troubled by her intense dreams of a lost ruined city of towers, she doesn’t want to give up her dreams, or be controlled, live a life of flower-arranging in her time off, like her very dull mother. Dante leaves the cell in shock and so a mystery begins to unfold. Who is Dante Cazabon, really? Who was his mother? And will Bea submit to the coming-of-age ceremony? When Dante and Bea meet and how it alters both their lives forever is the driving force of the first volume, and of course Ezekiel will prove to be pivotal in the eventual escape from the asylum. Things begin to change when Bea discovers there was a scandal in her father’s past on the same day she is shunned for being seen to be speaking with the kitchen boy. Kids can be cruel in a society where everyone knows their place. Dante wants to know about the city Bea dreams about; Bea wants to know if it is real. Perhaps the madman Ezekiel knows more… if he can still speak after his daily shock therapy ordered by the cruel asylum director. Reading The Hollow People again after some eight years one is struck how prescient Keaney’s writing is and how relevant. Dr Sigmundus could be Assad in Syria, Putin in Russia. Control of body and mind is essential, manipulation of facts and history, propaganda and lies presented as the truth, using drugs to control young rebellious minds. Keaney doesn’t shirk the unpleasantness, does not avert his eyes from blood and carnage, his stories expect a reader to approach it with eyes wide open and learn something about how ruthless people will use any means to perpetuate their power. Which leads us to The Cracked Mirror and The Mendini Canticle which complete the trilogy. I can possibly see why there might have been reistance to buying The Cracked Mirror, at 147 pages it is a tad thin and really should belong to the first volume as it has a very natural and spooky cliff-hanger (on a cliff no less) ending. I don't want to go into any detail of either book as to do so only spoils the read. The Mendini Canticle continues the story vividly with a complete transformation of Dante and continuation of the Nyro/Luther sub-plot with arcane black-magic thrown in for good measure. Bea emerges as a true heroine, but the outlook for humanity looks bleak at the best of times. I enjoyed these books and they are quickly read. The extraordinary tussel between Dante and the mind of a bird is brilliant and poignant. There's much to think about in these volumes, but I think Brian Keaney was badly served by his publisher and they should be just re-launched under one title as one book and they would find the sci-fi/fantasy readership they deserve. You can track the Hollow People and others from here.